The Potrero Walking Club, which meets three times a week, brings members of the community together for an inclusive activity. Photo by Clark Mishler, courtesy of BRIDGE Housing. In San Francisco, residents of Potrero Hill’s Potrero Terrace and Annex public housing face daunting economic and social challenges. The annual median income is $14,000 (about one-tenth the median income of the surrounding neighborhood), and violent crime in the area is five times the citywide average. According to the Family-Informed Trauma Treatment Center, families like Potrero public housing residents—those living in urban poverty—often encounter multiple traumas over many years. The toxic stress of chronic poverty, crime, untreated physical and mental health issues, and a lack of social and concrete supports leaves residents in “survival mode,” unable to envision stability much less a brighter future. Potrero Terrace and Annex (Potrero) were built in the mid-1900s and are two of the oldest public housing developments in San Francisco. Nonprofit BRIDGE Housing was selected in 2008 to lead the revitalization of Potrero under the HOPE SF program, a San Francisco initiative to redevelop the most distressed public housing in the city. BRIDGE will rebuild 606 public housing units and create approximately 1,000 new mixed-income homes, open space, and community facilities, along with support services to improve the lives of residents. The first phase of construction is expected to start in 2016. Based on five years of community building work at Potrero, BRIDGE Housing and San Francisco State University defined “trauma-informed community building” (TICB) as a new model for strengthening high-poverty communities as part of housing transformation efforts. TICB identifies strategies to support residents who may experience cumulative trauma directly related to chronic stressors such as concentrated poverty, racism, and isolation. This model encourages individual and system changes that take into account residents’ emotional needs and avoid re-traumatization triggers, which “traditional” models of community building may ignore or exacerbate. “Trauma-Informed Community Building creates an environment where people can come together and have something positive in their lives,” said Emily Weinstein, director of community development for BRIDGE, and a co-author of the TICB white paper. Principle 1: Do No Harm. Be aware of past and current trauma and promote activities, programs, and services that avoid re-traumatizing individuals and the community. Acknowledge that traumatized communities face ongoing insecurities around the sustainability of programs, services, and institutional relationships, so only engage in activities when financial sustainability and organizational structure are guaranteed for multiple years. For example, imagine that a food bank is established and becomes a valuable resource that clients can count on. If the service is suspended due to funding cuts, then food bank clients will experience the loss of a critical resource—a trigger for being let down, unable to rely on a service, and, perhaps once again, not knowing where they will obtain food. Less successful programs also have barriers that inhibit participation. A program offered only during regular weekday hours does not work for participants who have full-time jobs. A program with no accompanying child care is tough for participants with young kids. A program that mandates a specific time commitment—e.g., “must attend this parenting class three times a week for six months or else you have to drop the class”—discourages participation, especially by individuals who have irregular work schedules or who are not ready for such a commitment at this point. Under the TICB principle of “do no harm,” such a program would be created to be inclusive and accessible rather than exclusive and punitive. Principle 2: Acceptance. Meet residents where they are, accept the realities of the community conditions, and set expectations accordingly. In communities of deep poverty and social neglect, where services and engagement have been nonexistent or inconsistent, not everyone’s going to sit still and be quiet, and not everyone’s going to be on time. Some participants might show up unexpectedly with children, because they have no option to do otherwise. People may be hungry, tired, and stressed. Some struggle with substance use. To promote a place of acceptance, TICB rolls with the chaos and sets basic ground rules that are as inclusive as possible. The Potrero Walking Club, for example, sets an expectation that participants simply be ready to participate when they arrive; people can drop in and drop out at different times, or even participate under the influence as long as they are not disruptive or harmful. Principle 3: Community Empowerment. Recognize the importance of self-determination to encourage community investment and that everyone can play a supportive role. Peer support—where members of a community lead and learn from each other—promotes a sense of hope and control, and validates individuals’ actions as having meaning and value, which is necessary for visioning for the future and actualization of plans. TICB applies a “scaffolding” approach that sets expectations higher than current standards, but with intermediate steps and rungs so that people can join in at their own best levels. When a population is stable with infrequent churn (such as at Potrero), it is possible to build expectations in a tiered way, and to increase expectations over time. The Healthy Generations Project at Potrero, for instance, has multiple points of access. Any parent with a child age 5 or under can participate in the early childhood activities. Workshops are open to all, though with some ground rules. Workshop participants who desire to become community health leaders—residents who are trained and hired to lead Healthy Generations activities—must submit an application, attend a training program, and pass a test. This scaffolding approach allows people to engage and grow from a range of starting points. Principle 4: Reflective Process. Take a sustained approach over multiple generations to improve outcomes in a trauma-affected community. TICB engages in an ongoing reflective practice that responds to new developments and knowledge, and is constantly adjusting to meet the needs of the community and the overall vision for the neighborhood. The big goal is to get people ready for a mixed-income community. Nobody is too traumatized to participate, and people participate along different trajectories. At Jordan Downs, a redevelopment in Los Angeles that is similar to Potrero, BRIDGE and its service partner SHIELDS for Families have created an employment system. All participants come in with a statement, e.g., “I want to work,” and the system is tailored to accommodate them. Some are ready for jobs right away. Some have moderate barriers to address first, such as unstable housing or lack of a GED. Others have significant barriers—they might be in a domestic violence situation with no GED and substance-use issues. However, there is a place for every person in the employment system. Similarly, there is a place for everyone on the community building scaffolding that is readying people for physical construction, new buildings, neighbors, and a changed community. These principles highlight the importance of meeting residents where they are (not just physically, but socially and emotionally). This can be done through flexible, inclusive, and accessible programming; providing feedback and rewards for achieving milestones, such as presenting gift cards to residents who attend a certain number of activities, or holding a celebration when a group completes a survey; fostering community-wide support; minimizing stress; and allowing residents to move at their own pace. Slowly and carefully brokering relationships between communities and institutions that serve them is also important—and challenging, as TICB asks systems to adapt to the community. For example, if there is a local public health clinic that residents do not turn to, then BRIDGE as the housing anchor can facilitate conversations about why, working with all stakeholders to identify common goals, find solutions to barriers (such as language, services offered, outreach, misperceptions), and collaborate to achieve results. As a traditional “houser,” BRIDGE is not positioned to be a school, clinic, or social services provider. But because education, health, and other disciplines are critical to the success of the whole, BRIDGE can serve as a leader that engages systems, partners, and the community in an organized way to sustain the long vision for the project. As a “community quarterback,” BRIDGE acts as a lead agency that is both deeply invested in the project and has staying power for a decade or more of extremely challenging work—staying power that can remain relatively consistent where other positive forces, including policies, public funding, and political will, might shift over time. BRIDGE is deliberately advancing collective impact through housing development within the framework of neighborhood institutions. “Where there are existing strengths in a community, there is no need to reinvent the wheel; where there are gaps or needs, let’s fully understand those and collaborate on solutions that will work best for the neighborhood,” Parker said. And TICB can inform the community quarterback role. At Potrero, the four principles have been put into action through a host of activities tailored to serve the needs of residents such as a weekly dinner and reading group for parents and children, a robust garden program, twice-weekly Zumba classes, a sober living group, and leadership academies. It is important to remember that TICB does not dictate specific activities, only that the activities are expressions of the principles and accessible ways for residents to participate and engage. For example, Zumba at Potrero is less about exercise or impacting health outcomes than it is about engaging community members—both public housing and surrounding high market—in a participatory and fun activity that builds community. Participation can then be leveraged to engage residents in a conversation about their needs and how systems can change to better serve those needs. This is based on creating a trusting relationship by holding Zumba classes on a dedicated schedule that people can count on whether they attend or not, making the classes flexible and accessible for all ages and abilities, and ensuring that Zumba is welcoming and neither judgmental nor exclusive. Once a trusting relationship is established, people are much more willing to take a survey, participate in a focus group, or share information about their needs and hopes. While the content is health, the activity’s purpose is engagement, empowerment, and influence on the systems that impact residents. The majority of activities take place at the same time and place every week, with some offered multiple times per week. Holding activities on a consistent schedule is a way to demonstrate reliability to public housing residents, who may not experience a great deal of stability day-to-day. Some of the activities and offerings have stemmed from resident-expressed needs and feedback. For instance, the Potrero Sober Living Group was created at the request of residents. In some cases, more offerings per week are added due to demand from the community. These are visible steps taken in response to residents, which is validating (“We heard your request and we responded”). Unlike traditional programs and services, which tend to be deficit driven (e.g., “residents are lacking in XYZ and therefore need to attend a class/join a program”), these activities are strengths-based and emphasize TICB principles that build trust and are sensitive to the impact of trauma on people’s willingness or ability to participate in institution-led activities. Zumba is promoted as “an opportunity to meet your neighbors and get your groove on,” rather than as a weight-loss or obesity-prevention measure. Even mentioning the words “exercise” or “weight” is counter to the community building purpose. In terms of sensitivity, one frequent Zumba participant is a disabled shooting victim who has occasionally behaved in a way that disturbed others; rather than banning him from the class, the organizers worked with him to find an appropriate way to use his energies. Now he is a Zumba “cheerleader” with a designated place to dance, and his fellow Zumba-goers enjoy his participation. TICB is also a means to laying the foundation for the mixed-income community that’s on the horizon. The public housing at Potrero is on the edge of a wealthy community, and as construction progresses, residents will begin to see a range of housing options, from public housing to affordable to market rate. In this neighborhood, there are a lot of adjacent market-rate residents already, so TICB is being used to create more mingling and partnership among residents. The annual Unite Potrero event, for example, brings both sides of Potrero Hill together for a day of activities the whole community can participate in: service projects like a street clean-up, a BBQ contest, face painting, and sack races. “The garden has brought together a lot of community members that I don’t think would have normally interacted before,” said Monica Ferrey, president of the Potrero Annex Tenant Association and a community health leader for Healthy Generations Project. Just as at Potrero, BRIDGE is bringing together public and private partners to renew Jordan Downs and provide cradle-to-career support for residents. This has created an opportunity and deep learnings for BRIDGE. As BRIDGE refines and expands TICB, it is paying attention to successes and challenges along the way. The Trauma-Informed Community Building Evaluation, published in mid-2015 by the HOPE SF Learning Center with support from the Annie E. Casey Foundation, found that participation of public housing residents and greater Potrero Hill residents in community building activities grew substantially since the introduction of the TICB model. The team learned that recruiting and training community leaders can be a double-edged sword: it is rewarding and effective to elevate people into leadership positions, but the leaders can be perceived by others as receiving special privileges, and if there’s a sense that things are unfair, that erodes trust. Long-distressed communities such as Potrero often come with histories of infighting, nepotism, and personal baggage among residents. TICB acknowledges that any amount of trust gained is extremely fragile and is subject to the influence of complex relationships that precede redevelopment activity. The team strives to be exceptionally transparent, and to present processes and decisions clearly and objectively. Another lesson learned is the need to integrate “mindfulness”—conscious awareness of the present—into activities and programs. Conflict and chaos are frequent in communities such as Potrero, and people who have experienced chronic trauma do not necessarily have the tools to manage day-to-day conflict well. Building mindfulness into activities helps suspend the drama and provides a place for positive interaction. 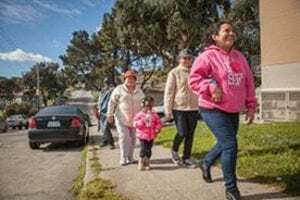 For example, at the Potrero Walking Club, participants are expected to show up ready to participate, and they are encouraged to concentrate on the moment at hand, setting personal gripes or other conflicts aside to instead focus on walking and talking with fellow community members. Over time, the Walking Club has become an almost sacred institution, one that participants and observers know is not to be disrupted.